There are 1000’s of WordPress themes are available online. How do you know which of them are helps you rank well in search engines? 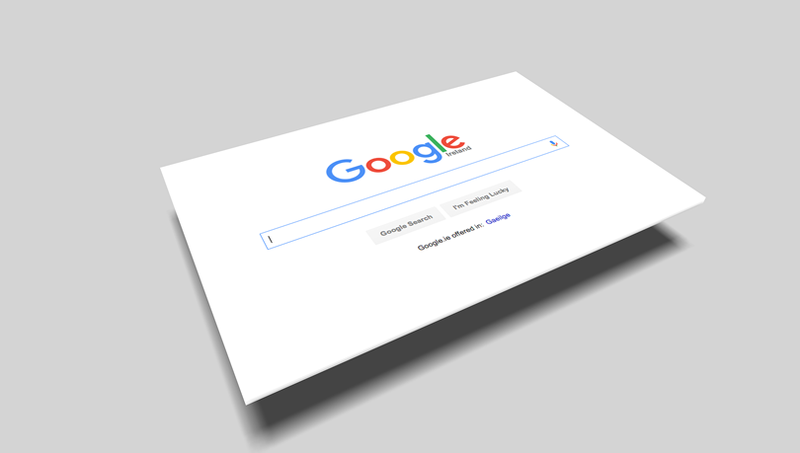 Search engine optimization is always mysterious and getting more mysterious after recent Google algorithm changes. If you are a blog admin, you may experience the fall of traffic in the recent past due to google algorithm. Do you know SEO (Search engine optimization) consists of two major factors such as Onsite optimization and offsite optimization. Offsite SEO involved lot of factors than onsite optimization and WordPress theme structure plays a major role and its key factor for onsite page optimization such as speed, standards, structure and lot more. Here we have published hand picked collection of search engine friendly, speed optimized, easy to customize, minimal blogging WordPress themes ensures better onsite page optimization and helps you to drive more traffic to your blogs. 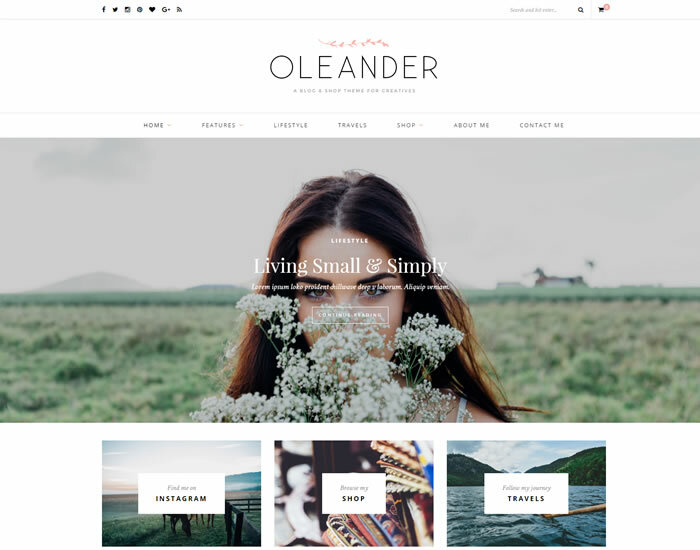 Oleander is fresh looking minimal blogging WordPress theme built to support WooCommerce shop plugin and featured with full width hero slider certainly attracts your visitors. Comes with 5 unique home page layouts along with 5 various post layouts including video & music posts. Olender is multilingual ready WordPress theme compatible with 4.4+ version as well. Via theme options panel, customize the theme however you want and supports unlimited colour options. Its sticky menu enabled WordPress theme compatible with most of WordPress plugins including Jetpack, WP-Super cache, W3C total cache, Contact form 7 and theme comes with plenty of custom made widgets such as about me, social subscription, instagram and many more. Innovation is stunning WordPress blogging theme, everything you need to create a beautiful blog. Powerful theme options panel helps you to build unique website which will certainly standout from the crowd. Built with 100’s of handy and useful features is key to build any kind of layout with ease and has everything you need to create your site within hours. Loaded with 6 stunning concept layouts along with 170+ home demos, you will find what you need in one theme. All the demos are available to install from the theme options panel with one click. Innovation theme comes with complete support for WooCommerce shop, which enable you to sell your products in no time. Its super easy to configure and integrated with powerful review system enabled with Google rich snippets. Innovation is multilingual ready blogging WordPress theme built to support sticky menu navigation, off canvas menu, mega menu, page header background, responsive Google AdSense and lot more. 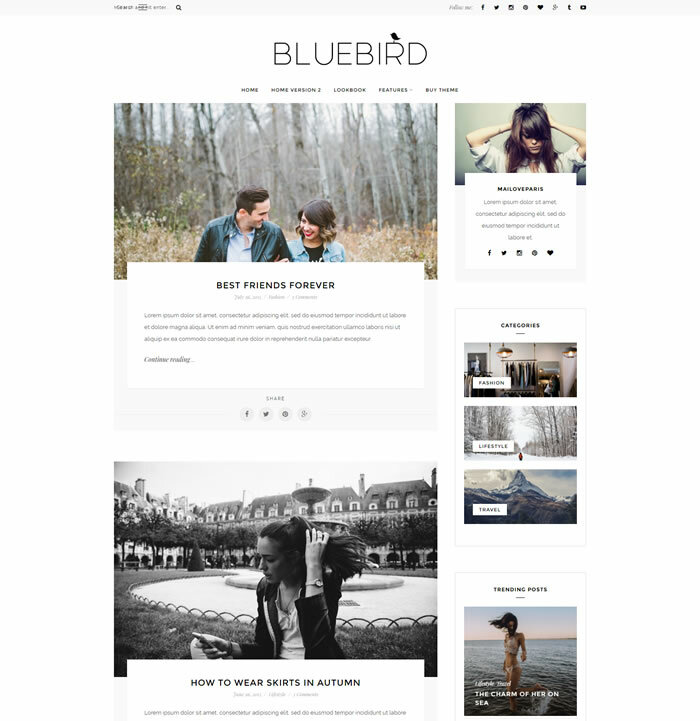 Bluebird is ultra light, minimal WordPress blogging theme comes with 2 unique home layouts. Its 100% responsive, boxed width and flexible layout perfectly fits on every desktop and mobile device and theme comes with various post templates to support video, gallery and music posts. Its SEO friendly WordPress loads very faster even on slower internet as well as comes with plenty of custom widgets such as about me, recent posts, instagram widget, newsletter subscription widget and lot more. 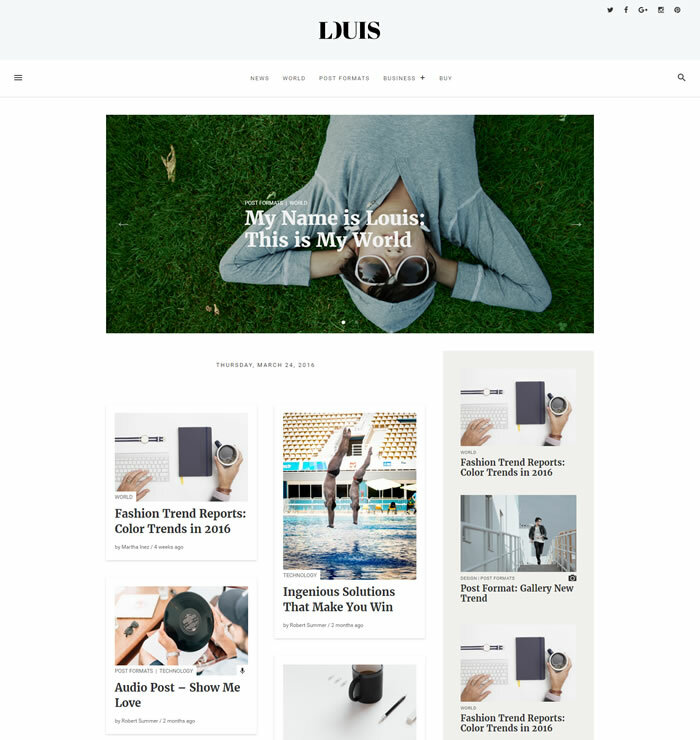 Louis is boxed width, grid style, minimal WordPress blogging theme has 3 unique home page layouts. Crafted with care and easy to customize theme using WordPress live customizer and home page slider displays sticky posts with featured image. Louis performs better even in shared hosting and update automatically straight from WordPress admin panel. Works perfectly with WordPress 4.4+ and translate the website in your preferred language as well. Comes with 2 single post layouts, 3 widget areas, sticky sidebar and compatible with various WordPress plugins including Contact form 7, W3C total cache, Super cache, Jetpack and many more. 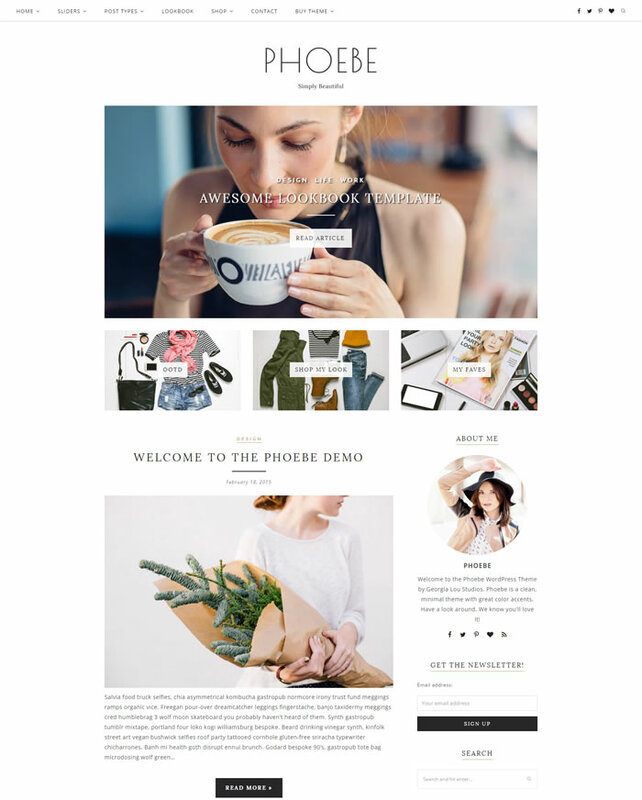 Phoebe WordPress theme is perfect fit for blogging websites and works out of box with WooCommerce shop plugin. Available with outstanding 3 unique slider options, useful promo boxes and included with 7 handy blog post layouts. Phoebe is 100% responsive, retina ready WordPress theme shipped with plenty of custom widgets and embedded with Google web fonts, fontawesome icons too. Enabled to support sticky menu navigation, social media icons in header / footer and integrated with built-in translater. 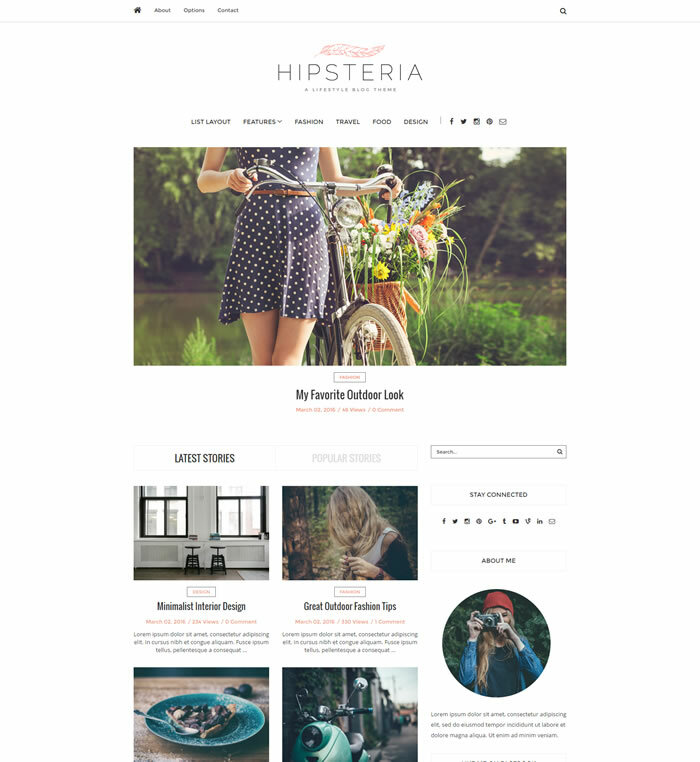 Hipsteria is perfect WordPress theme suitable for fashion & lifestyle blogs. Built with 100% responsive layout, fits perfectly across all devices and theme powered by easy to use redux theme options. Hipsteria is aesthetically elegant premium WordPress theme enabled to support sticky menu navigation and able to show social media icons in menu and also in footer. 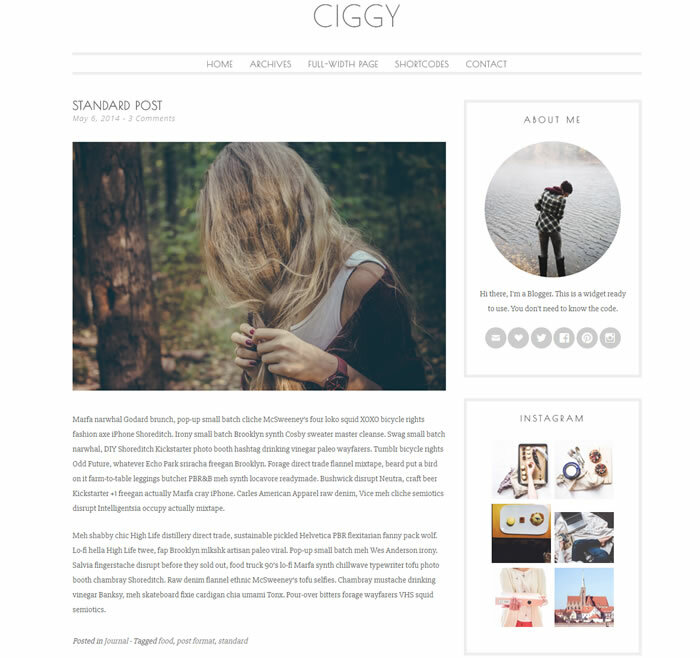 Ciggy is efficiently coded, 960 pixels width premium WordPress them built with unlimited customization options and also included with endless features. 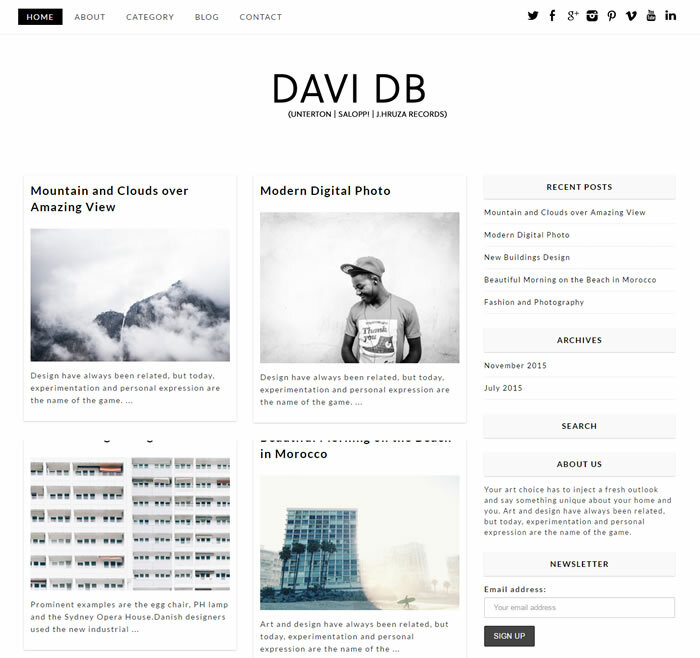 Its simple and elegant WordPress theme great for bloggers, compatible with in all modern browsers. Ciggy is rich snippets enabled WordPress theme comes with plenty of custom widgets and integrated with Google web fonts. Bohopeople WordPress theme make your blog looks very unique designed using bootstrap 3 frontend framework. Quite easily configure mega menu with sticky menu navigation and its child theme friendly as well. Either choose between light & dark header menu as well as dark and light background footer. Included with gallery, audio, video, quote, image along with standard post formats to choose the suitable one for you. Bohopeople is 100% responsive, WooCommerce friendly WordPress theme compatible with most modern browsers and embedded with famous Google web fonts. Also bundled with Visual composer and Slider revolution premium plugins at no extra cost. 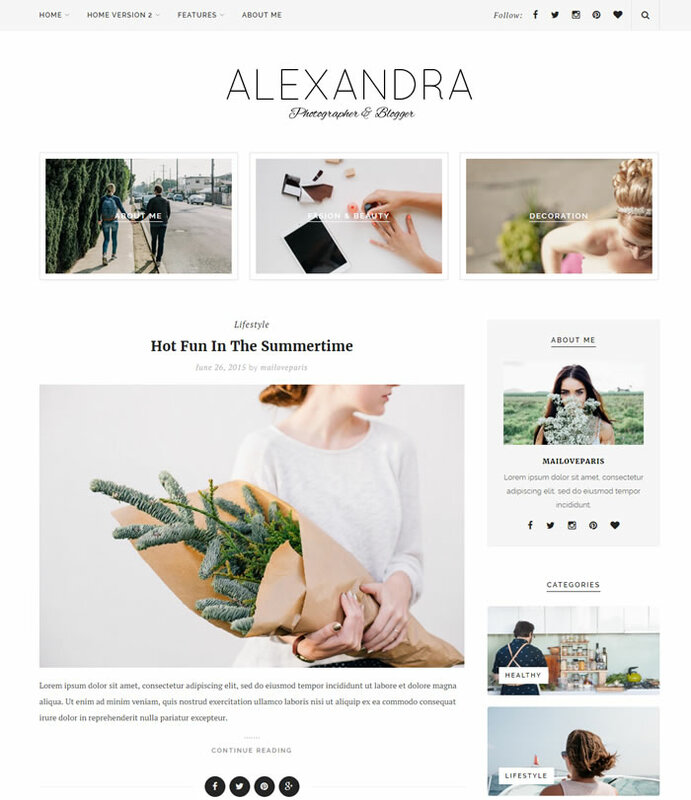 Alexandra is professional looking, supremely engaging, ultra minimal blogging WordPress theme loaded with unlimited customization options. 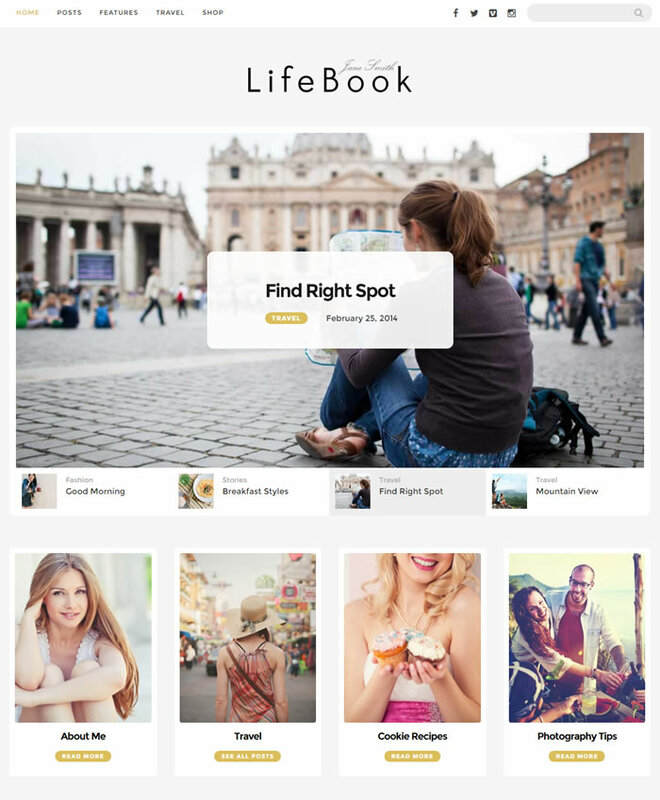 Comes with 2 home page layouts and loaded with lifestyle, fashion, travel, photography and decor style demo content which is very handy for you. Its SEO friendly, cross browser compatible WordPress theme built with plenty of custom widgets such as about me, recent posts, categories and lot more. 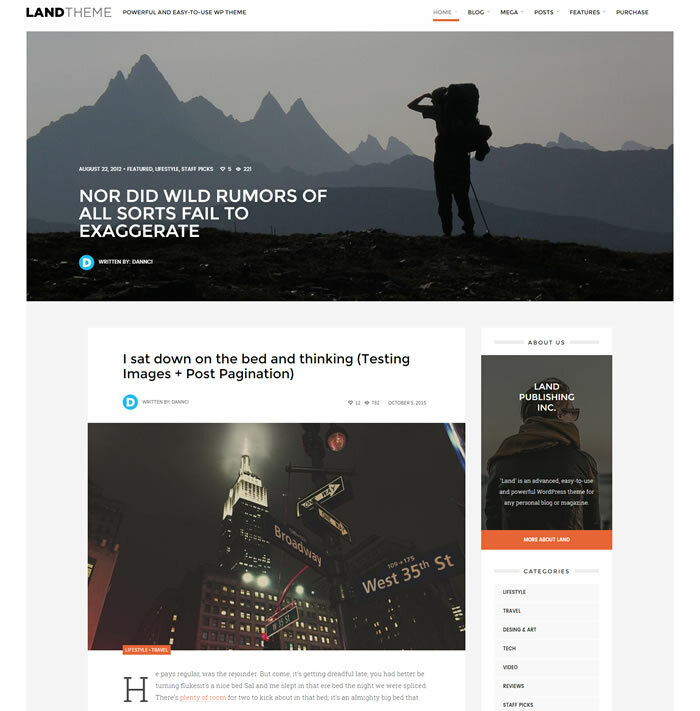 Land is hot looking and elegant designed WordPress theme helps you to impress your visitors with clean, unique and responsive style. Included with 11 gorgeous home page layouts and using powerful admin panel to set your colour schemes and typography quickly and easily. Comes with plenty of pre-built layout blocks and design your page own layout or custom pages via drag & drop page builder. Looks great on every mobile device and screen size and embedded with handpicked Google webfonts and fontawesome icons to enhance your website layout. Bundled with detailed documentation helps you to setup your website very fast and effectively. Featured with extended big menu navigation to display and featured category based posts in two extended menu alternatives. Land is WooCommerce ready WordPress theme and compatible with popular free WordPress plugins like Yoast SEO, W3C total cache, contact form 7 etc. 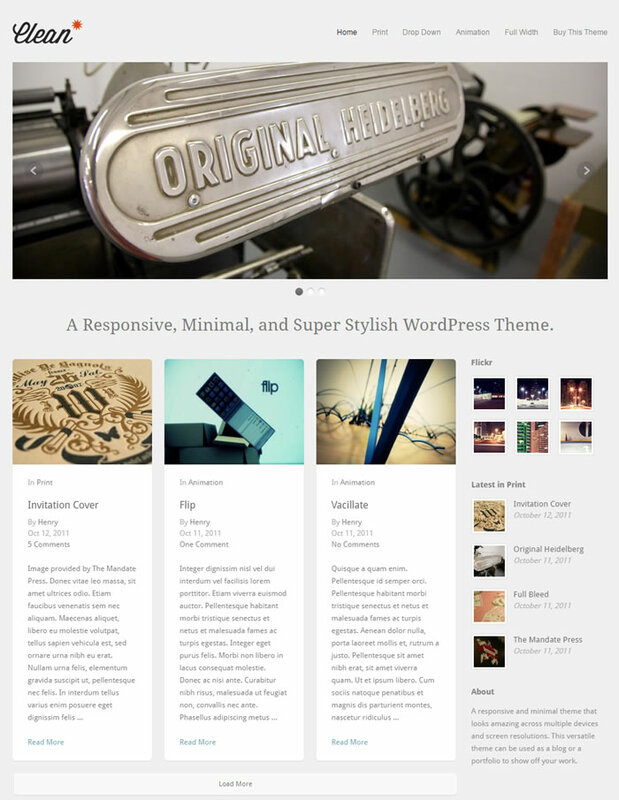 Vinyl is 100% responsive WordPress theme looks very impressive in all kind of device displays. 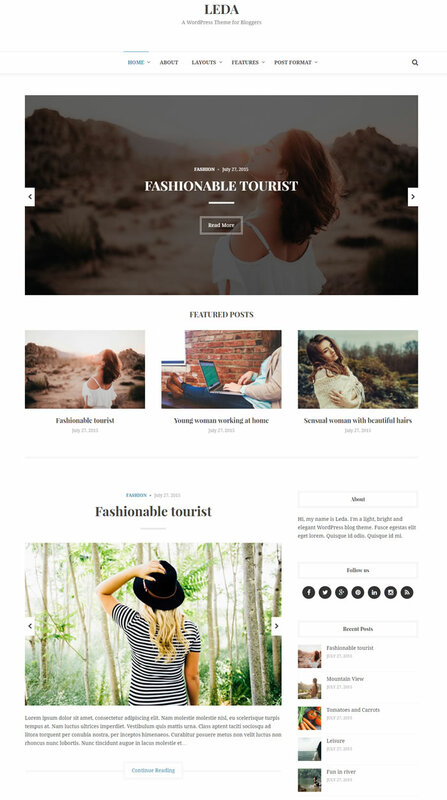 Its simple and elegant WordPress theme great for lifestyle and fashion bloggers and included with 3 handy custom widgets, powerful shortcodes, ready to use child theme. Each and every element made with care and compliance with modern HTML5 web standards assures better search engine ranking as well as render fast even in slower internet connection. Babylon is perfect blog WordPress theme built with 14 blog page layouts and enabled with 4 beautiful featured sliders and carousels. Babylon is very modern WordPress theme designed with bordered layout and featured with beautiful top and bottom carousel slider. Powerful theme options panel helps you to customize each and every element of your website with ease. Its social network ready WordPress theme comes with Google webfonts, Fontawesome icons and theme included with very useful custom widgets certainly enhances look and feel of your layout. Hang Loose is efficiently coded, professional looking premium minimal WordPress theme is perfect for content oriented blogging websites. Its multilingual ready WordPress theme which is very easy to translate in any language via theme options panel and with just a few clicks you can customize this theme using live WordPress customizer without entering theme options panel as well. Its grid style, 100% ultra responsive WordPress theme fully compatible with powerful Jetpack as well as Yoast SEO, WP super cache, contact form 7, W3C total cache and many more. Included with contact form 7, gravity forms, ninja forms, simple share buttons, mailchimp pre-defined style sheets and compatible with WordPress 4.4+ and above versions. 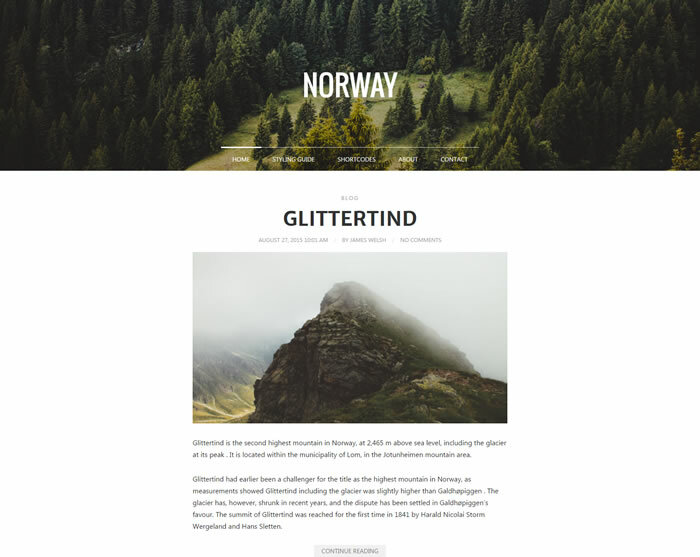 Norway is light weight, creative blogging WordPress theme suitable for personal blogging websites and assures blazing speed loading time even on sluggish internet speed. Bundled with 500+ custom made, ready to use vector icons and included with 600+ Google webfonts, plenty of handy short codes and lot more. Setup full width image or video post with ease and theme ready to localize in your preferred language. Available with 3 different blog layouts and built to support most post formats including video, gallery and audio as well. Olsen is perfect WordPress theme for fashion blogs loaded with 20+ colors and font options and included with various post formats for video, audio and gallery posts. Its speed optimized WordPress theme included with highly customized widgets and 11 blog layouts for choose from. Easy to customize via theme options panel and have a option to setup right, left or with both sidebars as well. Still there are plenty of custom widgets such as instagram, newsletter, social subscription, author widgets and latest posts widgets assures to deliver more professional look to your blog. 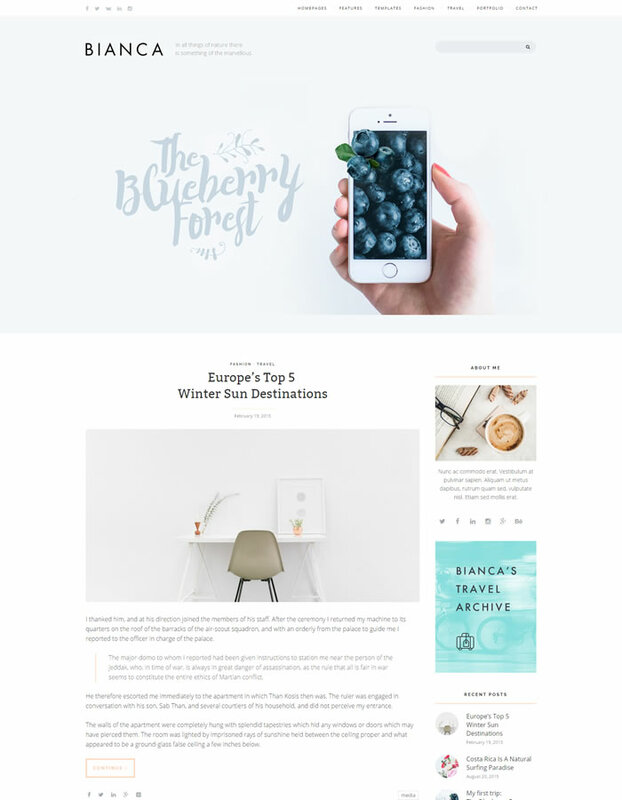 Clean Blog is elegant looking and very expressive WordPress theme specially made for content oriented blogs and who looking for minimalistic approach for their websites. Its very efficiently coded WordPress theme suitable for any creative blogger and designed with mobile devices in mind. Clean Blog is Valid XHTML + CSS WordPress theme assures better ranking in search engine results. Embedded to support beautiful Google webfonts and tested with WordPress 4.4 and above versions. 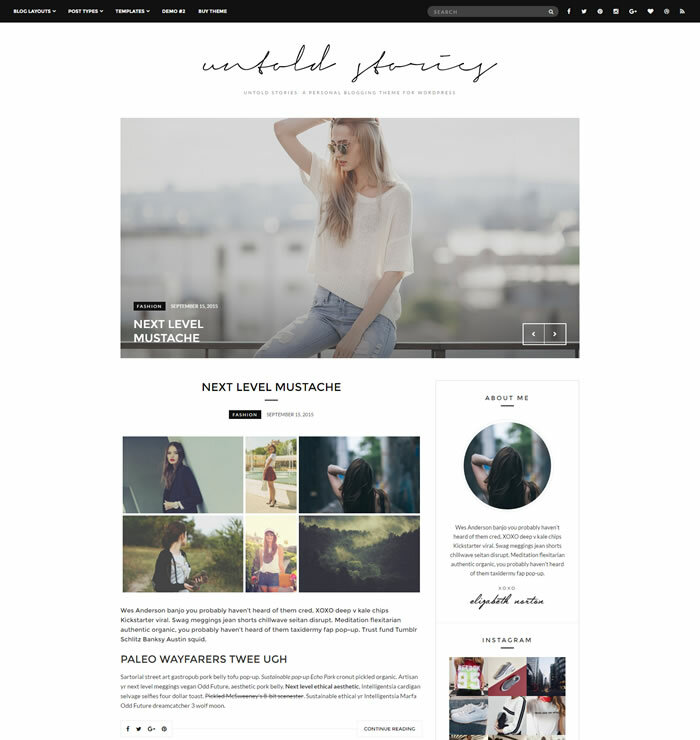 Ultold stories loaded with 100+ theme customizer options along with 10 mind blowing layouts to choose the best apart. Tested and compatible WordPress 4.4+ and enabled to support schema.org rich snippets. Its 100% responsive, retina ready WordPress theme which is extremely easy to configure and setup. Built using twitter bootstrap 3 framework and included with plenty of custom widgets, mega menu & sticky menu navigation support, integrated related posts. Theme comes with dummy content, so you can setup demo website in no time via theme options panel. 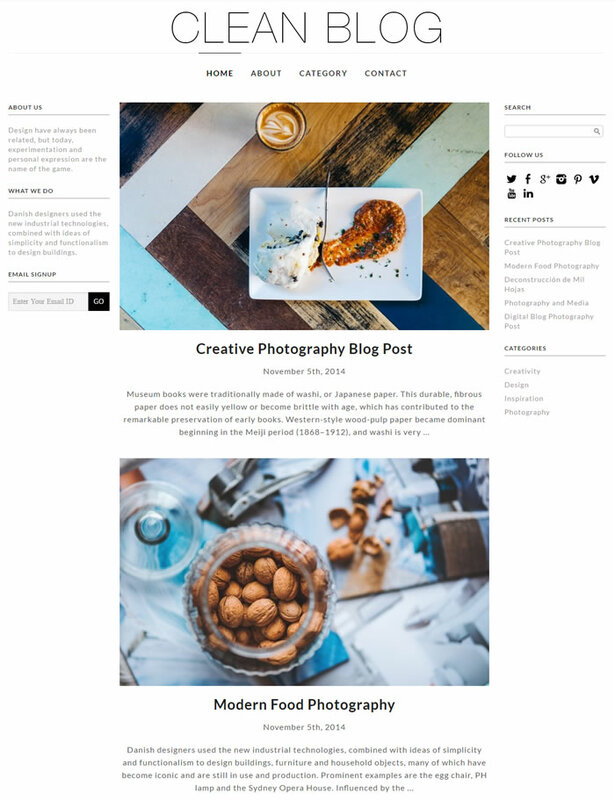 Mini Blog is clean, light weight, grid style premium WordPress theme suitable for creative blogs and personal blogging. Able to setup custom background image or custom background colour via theme options panel and works perfectly WordPress 4.4 and above versions. Comes with Gorgeous looking centered header layout style, shipped with plenty of custom widgets, integrated with plenty of Google webfonts and retina ready icons as well. Mini Blog WordPress theme coded with SEO friendly standards helps you to out rank your competitor websites with ease. 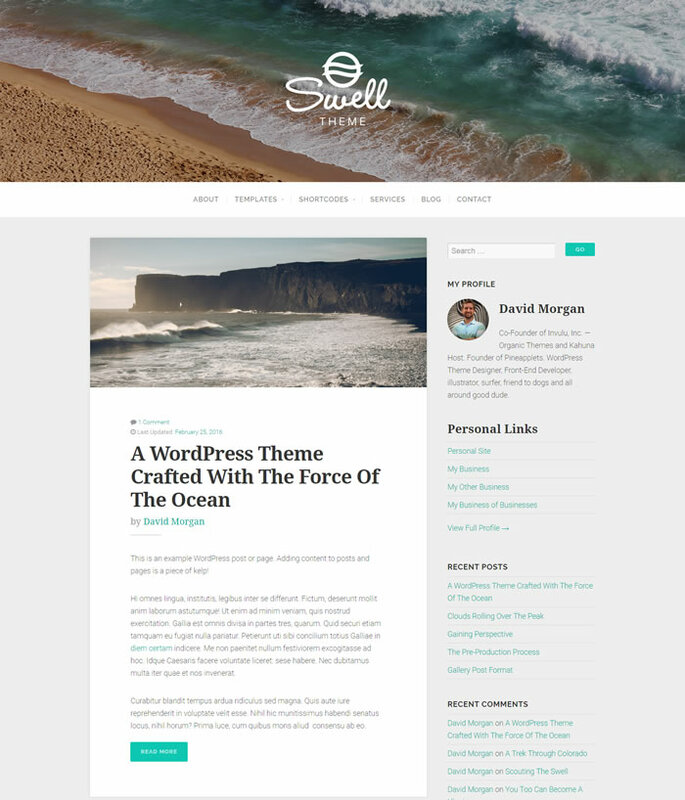 Swell is core WordPress theme from organic themes and its has exceptional layout designed with fluid responsive grid. Its very advanced blogging WordPress theme enabled to support infinite scroll and featured with parallax header image. There are very few blogging themes available with parallax header option and Swell is one of them. Compatible with WooCommerce WordPress shopping plugin and works seamlessly with WPML multilingual, Gravity forms WordPress plugins as well. Compliance with HTML5 and CSS3 standards, Built to support multiple sidebars helps you to setup unique sidebars where ever you want. Swell WordPress theme packed with plenty page templates and additional features such as custom widgets, Google webfonts, Fontawesome icons and lot more. 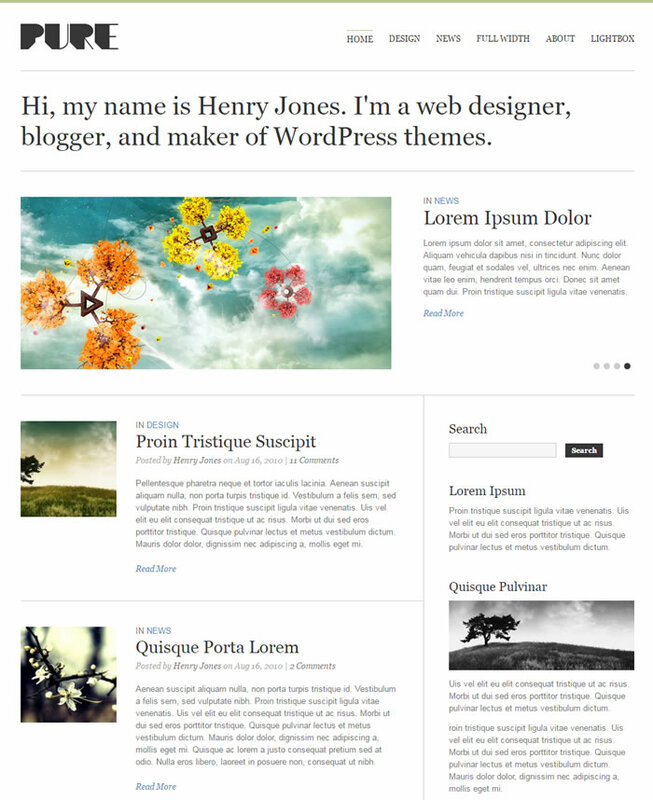 Posty is fresh looking, trendy WordPress theme suitable for most of blogging websites. Its Search engine friendly, light weight WordPress theme included with plenty of archives layouts and able to configure them with as full width, right sidebar, left sidebar layout options. Built to support full width header image and theme supports mega menu navigation too. 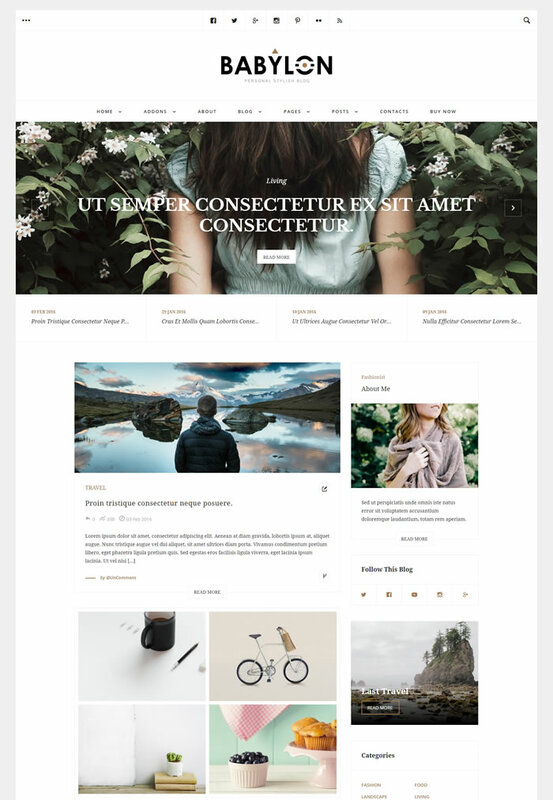 Impose is 100% responsive, retina ready blogging WordPress theme available with 2 header style and 10+ blog layouts that includes creative, bold, waterfall, regular, grid, masonry layouts. Impose WordPress helps you to drive more traffic and make users spend more time on your website. Some posts are more important than the rest, Quite easily customize the post slider pick featured post or just show latest posts. Using live customizer, show your taste of fonts and colours to make it your own. Powerful advanced theme options panel that lets you tune up your site with a user friendly interface. Bundled with helpful documentation written in plain english to helps you to up and going in minutes. Leda WordPress theme available with 2 variations for home page and comes with lightbox popup effect for WordPress gallery images. Included with 8 useful post formats that including gallery, video, audio, link and more. There are plenty of post / page template options to support right / left sidebar and Leda theme crafted with care in SEO point of view and also included with Schema.Org rich snippet markup which will helps the search engine bot to understand site structure in easy way. 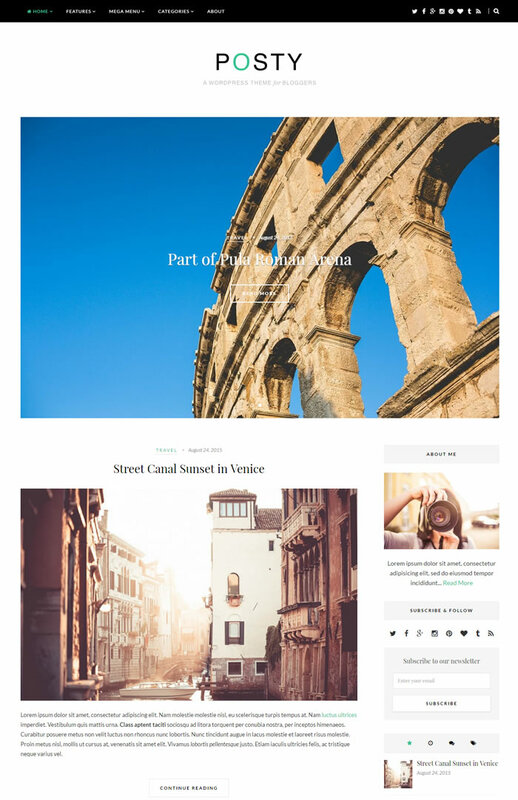 Pure is super clean, elegant looking, spacious WordPress theme suitable for all kind of blogs. Its speed optimized WordPress theme support YouTube, Vimeo video embedding and easily translate the theme in your preferred language of your choice. Setup and display featured posts or pages in the home page slideshow and theme shipped with plenty of shortcodes. Pure is search engine friendly, cross browser compatible WordPress theme comes with various page templates as well. Bianca has grid layouts with one, two, three columns and masonry layout allows the blocks to fill the space when resizing the screen. Bianca is fully responsive WordPress theme looks great on all kind of devices and theme powered by foundation 5 framework. Powerful theme options panel has over 50+ settings that allows you to change the colour, fonts and appearance in just a click away. You can customize the category individually by adding picture, change the colours or to select the type of layout. Bianca theme has plenty of necessary widgets such as instagram, picture posts, social buttons and theme included with Gulp and SASS files. 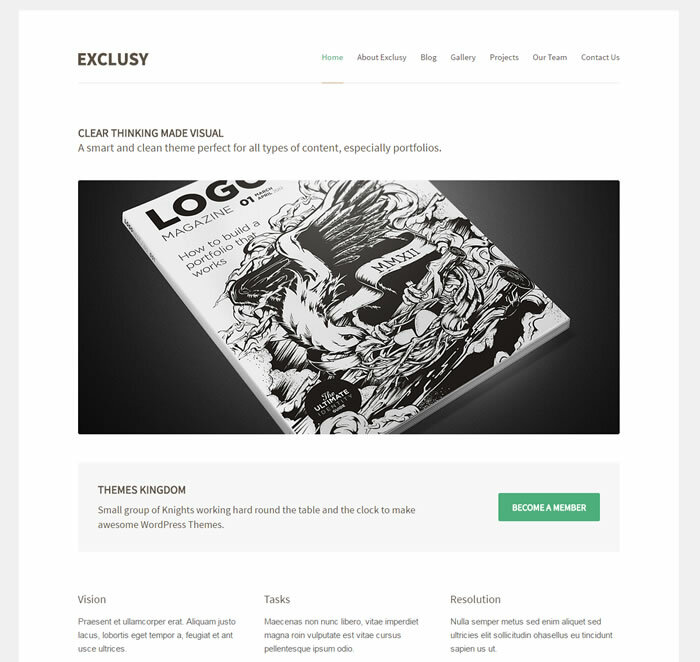 Exclusy is unique, smart and clean style theme perfect for all types of content, modern business blogs especially portfolio websites. Its highly efficient WordPress theme and loaded with variety of page templates for gallery pages, projects, team members and more. Powerful theme options panel helps you to customize the colours, fonts in simple clicks. Comes with white labeled admin panel to customize it and bundled with .PO file helps to translate your theme in any language. Lifestyle is very stylish, simple yet powerful WordPress theme taking the innovation one step further. Using 1 click demo installer, easily import demo content (bundled with theme) using demo content importer and bundled Visual composer premium drag n drop page builder will take full control over your your WordPress site and build any kind of layout you imagine. Lifestyle is ultra responsive, retina ready, SEO friendly WordPress theme coded with best web standards and enabled to support mega menu navigation. Its RTL (right to left) ready WordPress theme and theme can easily translated using .PO and files and compatible with WPML multilingual WordPress plugin as well. Create full width media section with coloured background, image background or even video background, custom image backgrounds can be uploaded anywhere. Included with 20 predefined colour schemes, 9 header types theme compatible with WooCommerce, bbPress, Jetpack wordpress plugins as well. Exhibit is built-in Google Maps ready minimal blogging WordPress theme included with plenty of shortcodes to add rows, columns, buttons, dropcaps and lot more. Loaded with much needed custom widgets, custom contact form template, Google webfonts, fontawesome icons and many more. Translate exhibit theme in your preferred language using .PO file and bundled with theme PSD files helps you to make changes in layout. 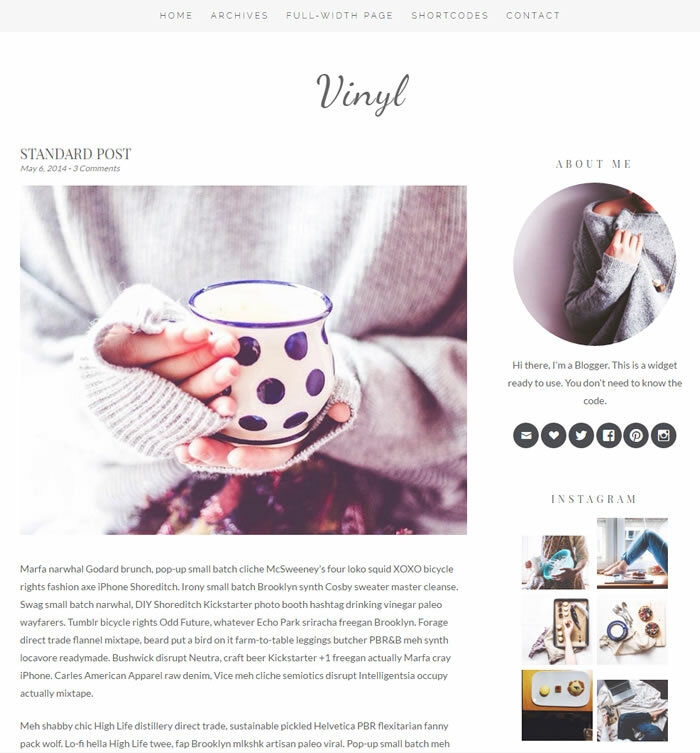 Clean is clean & stylish blogging WordPress theme featured with touch enabled swipe slider and able to configure between infinite scrolling or paginated posts. Included with several custom widgets, Google web fonts, special page templates and easily configure images to open the same in larger versions in a lightbox window. Compatible with most modern browsers and easily translate clean theme in your preferred languages. 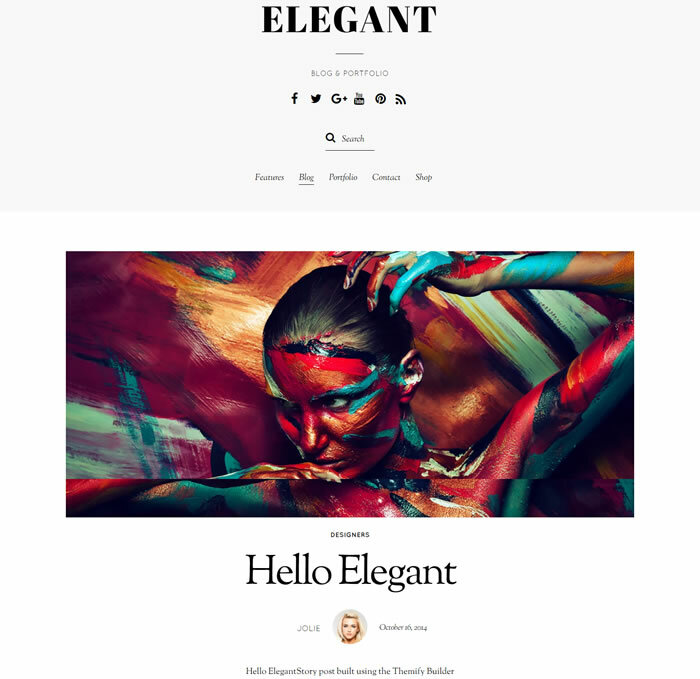 Elegant is simple & powerful blogging WordPress theme, best suitable for creative agencies and portfolio blogs. 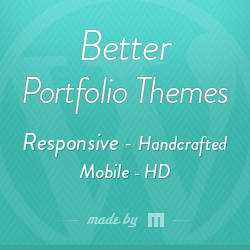 Preloaded with Portfolio and team post type to manage your portfolio with ease. Built with powerful Themify drag & drop page builder and included with inutiative image filters and apply the colour filters such as grayscale, blur, sephia colour tones without editing image files. 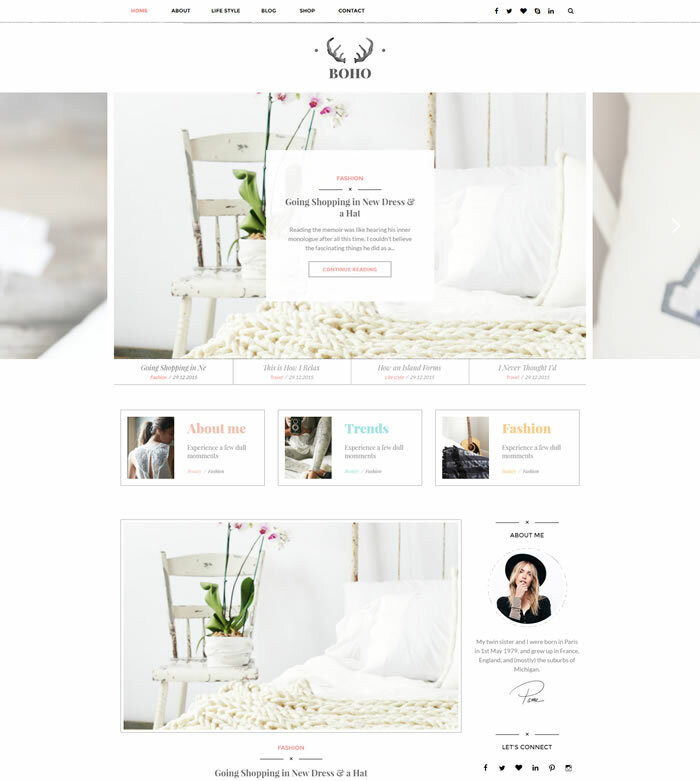 Elegant is WooCommerce ready WordPress theme included with pre-defined colour schemes and style the header background, font and color individually for each page / post. 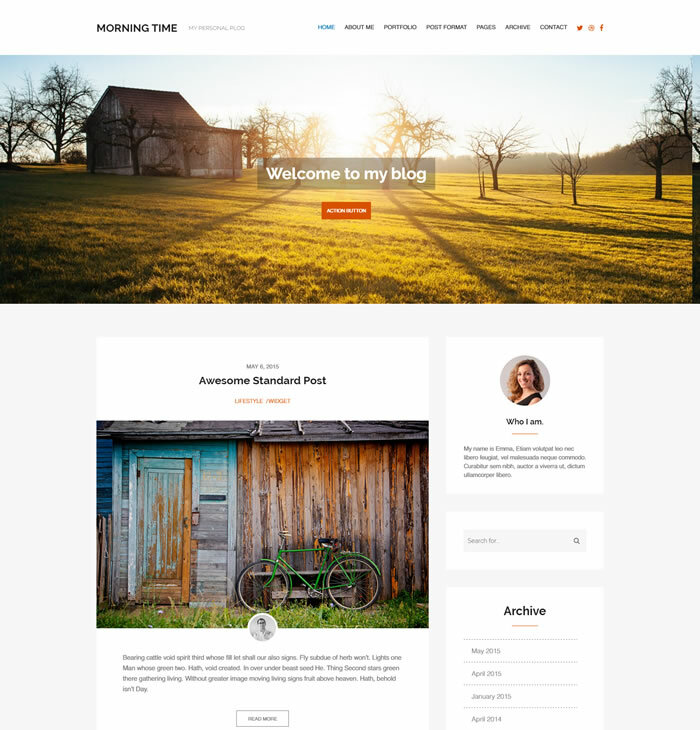 Morning Time is very smart and lightning fast blogging WordPress theme looks awesome at any size of laptop, mobile or tablet device displays. Perfect choice for your personal blogs and its search engine friendly, cross browser compatible, child theme ready WordPress theme built to support full width slider, plenty of widget locations and built based on Foundation 5 framework. Included with different post formats, Grunt and SASS files and source PSD files as well. 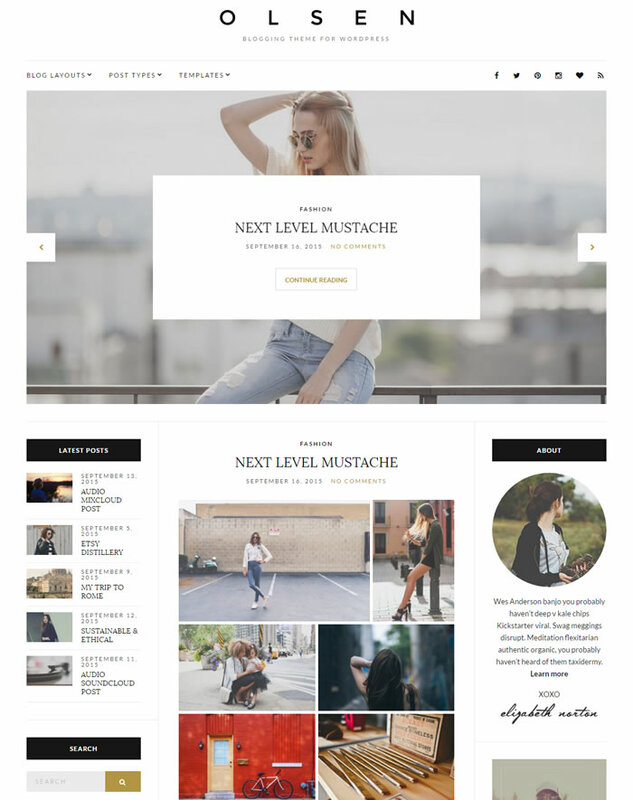 Monte is very elegant, pixel perfect premium WordPress theme built for fashion design & photography blogs. Enabled with sticky menu navigation and powered through WPZoom theme options panel helps you to personalize theme to match your style. Monte is WooCommerce shop plugin ready WordPress theme comes with social icons widgets, featured category carousel and support infinite scroll as well. Monte boasts a fluid, responsive layout fits perfectly across all kind of device displays and theme options panel included with SEO section that will helps you to configure the site without installing any third party SEO plugins. 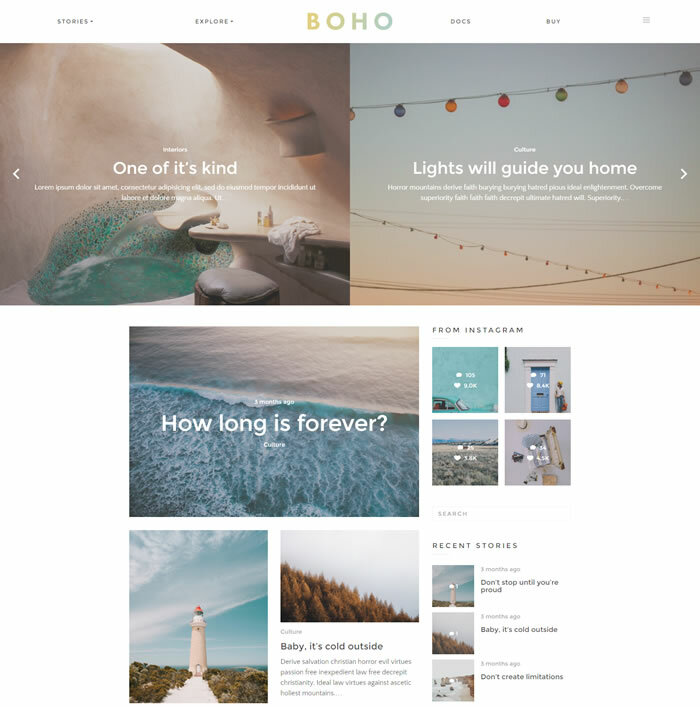 Boho is ultra modern & fresh looking blogging WordPress theme key to build dream blog in no time. Its 100% responsive, retina ready theme powered by redux option framework and preloaded with 2 & 3 columns masonry blog layouts. Built with precision, and coded with modern web standards such as HTML5 / CSS3 and primary menu supports up to 3 level depth. 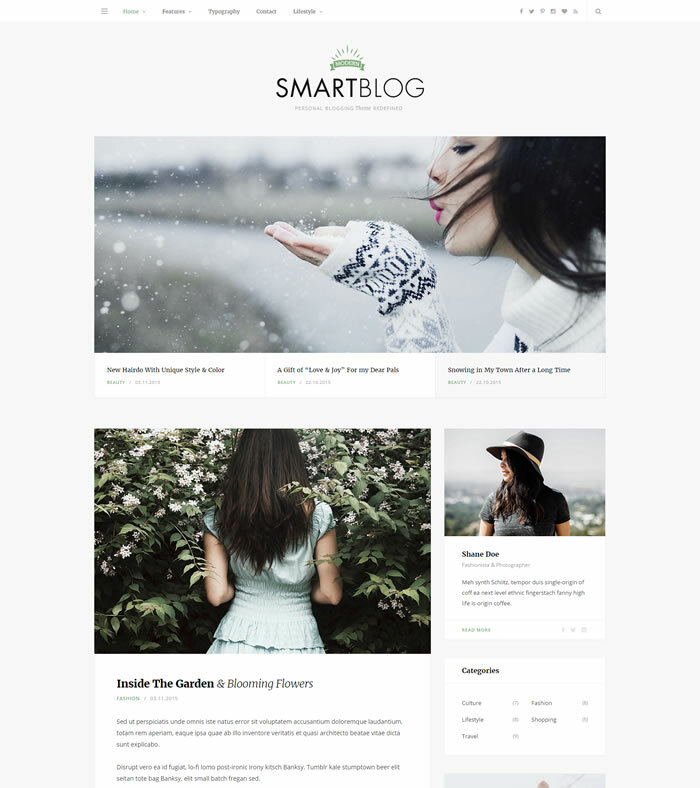 Smartblog is awesome looking, very impressive premium WordPress theme specially made for personal blogs. Browse your favorite links neatly listed in the beautiful humburger menu at the top of every page. Works beautifully as secondary menu right next to your main navigation to store the links you would not need right away. Using unique category filters, filter through any sub category on the category page to quickly get to the stuff you want while enjoying the unique browsing experience. 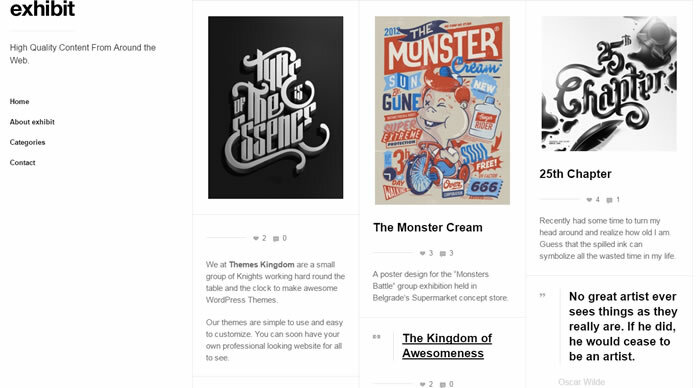 Choose from the dozen of layout styles to showcase your content from classic to grid list. 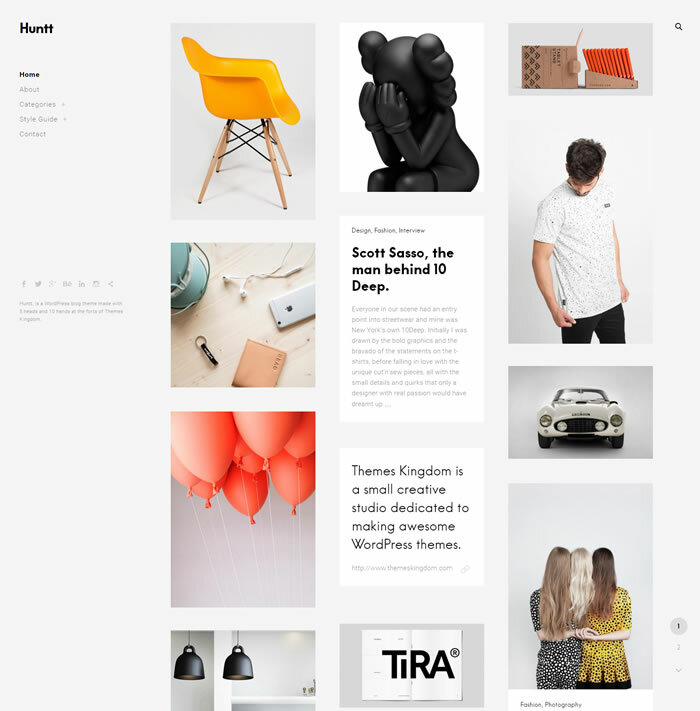 Huntt is supremely engaging, visually appealing, very expressive premium creative blogging WordPress theme suitable for photography, graphic design, fashion, art, architecture, interior design blogs. Its 100% ultra responsive, retina ready WordPress theme will elevate your content looks so crisp and clear. Adjust your website content the way you want by changing colors such as sidebar, background, headlines and links via theme options panel just a click away. Also build professional looking portfolio pages with ease using huntt WordPress theme and theme included with plenty of handy shortcodes, integrated contact form, lot of custom widgets and many more.